India. 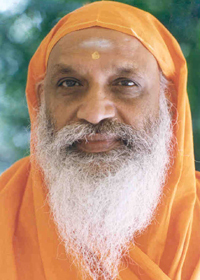 "Sri Swami Dayananda Saraswati is a distinguished, traditional teacher of Vedanta. His depth of understanding and nuanced appreciation of Western culture makes him that rare teacher who can communicate the vision of non-duality to modern listeners. He is able to make one see, with immediacy, the truth of oneself as the whole." "The word �advaita� is a very important word. It's a word that negates dvaita, which means �two.� The �a� is a negative particle, so the meaning would be �that which is nondual.� And it reveals the philosophy that all that is here is One, which means that there is nothing other than that One, nor is it made up of any parts. It's a whole without parts, and That they call �Brahman� (the Absolute), and That you are � because the nondual cannot be different from you, the inquirer. If it is different from you, then it is dual; then you are the subject and it is the object. So it has got to be you. And therefore, if you don't recognize that, you'll miss out on being the Whole."